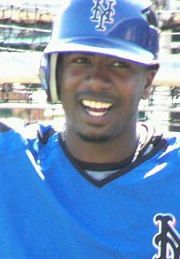 Ruben Gotay was once a prized prospect in the Kansas City Royals organization, their 2004 Minor League Player of the Year and a starter in the Futures Games. Somewhere on his way to be KC’s second baseman of the future, Gotay hit a rut and found himself a non-prospect, dealt away to the Mets in an unheralded trade for minor league utilityman Jeff Keppinger. Gotay spent all of 2006 in the minors, and was not on the 40-man roster over the winter. However, the Mets chose to promote Gotay, and not Anderson Hernandez, when Jose Valentin went down with an ACL injury. Since then, Gotay has flashed a brilliant glove, good speed, fine instincts, and some pop — batting .308 with 2 homers, 2 doubles, and 9 RBI in 39 ABs. This past Sunday, the planets were properly aligned to allow him a rare start, and he went 3-for-4 with a homerun, 2 runs scored, and 3 RBI. Such a stellar performance earned him a spot on the bench a few feet closer to the water cooler — after all, veteran scrub Damion Easley is on fire, batting almost .260 (and we know Willie Randolph likes to play the hot hand). He hustles too much and plays too hard, thus showing up some of the veterans. He is much too young — he’s only 24. He needs to pay his dues for another 10-15 years before earning respect and a fair opportunity. He hits the ball too far, forcing old men such as Carlos Delgado to run too much. He runs too fast, embarassing several of his teammates. His range in the field is extensive, giving Delgado an inferiority complex. His arm strength is above average, and thus hurts Delgado’s hand with throws. His cheery face and “happy to be here” attitude is a real downer. His ability to switch-hit confuses Randolph, who isn’t sure whether to pinch-hit him against lefties or righties. Due to the trade, his presence is a constant, if subconscious, reminder of Jeff Keppinger — and Randolph had at least 20 reasons to hate that guy. Reviewing the above, it’s obvious why Ruben Gotay remains on the bench. And his future prospects with the Mets don’t look good. If he doesn’t shape up quickly, he’ll likely find himself back in New Orleans when Jose Valentin returns next week. He’s batting seventh tonight . . .
only because Easley has a bruised knee or something, right ?